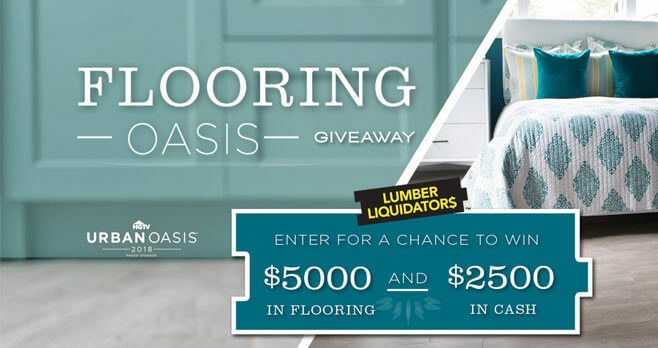 In celebration of the HGTV Urban Oasis 2018, DIY Network and Lumber Liquidators are teaming up to bring you the Flooring Oasis Giveaway. Visit diynetwork.com/flooringoasis now and enter daily through November 21 for your chance to win $5,000 in flooring and $2,500 in cash. The DIY Network and Lumber Liquidators Flooring Oasis Giveaway is open only to legal residents of the 50 United States and D.C. who are 21 years of age or older as of the Promotion start date. The Sweepstakes begins at 9:00 a.m. ET on October 1, 2018 until 5:00 p.m. ET on November 21, 2018. Limit of one (1) entry per eligible person, per day, during the Promotion Period. The grand prize consists of (i) a gift certificate redeemable for $5,000 in flooring products from Lumber Liquidators, Inc.; and (ii) a check for $2,500. Visit diynetwork.com/flooringoasis to enter and see Official Rules for details. HGTV.com/Renovate – HGTV’s Don’t Hate, Renovate Sweepstakes: What Would You Do With $50,000? really could use some new flooring. I love this flooring pick me please.